Many tennis clubs today uphold an all-white dress code. But does this homage to tradition come with the racism and sexism of the past? Wimbledon’s achromatic clothing policy hearkens back to the Victorian era, when donning colorless attire was regarded as a necessary measure to combat the indecency of sweat stains, particularly for women. Of course, back then, women customarily played tennis in full-length skirts and men in long cotton pants — also for propriety’s sake. But today, not all tennis clubs insist on all-white.While Wimbledon is known for having the strictest dress standards (even Anne White’s catsuit pictured above got banned there in 1985), the other grand slams, including the French Open (along with the U.S. Open and the Australian Open), have recently become venues for athletes to showcase custom fashions in dramatic colors and patterns. Since the advent of color TV, athletes have used their clothing to express their personality and distinguish themselves from their competitors. The new policy and the coded language Giudicelli used to justify it have been called out as both racist and sexist. By characterizing Williams’s catsuit as a failure to “respect the game,” the FTF echoes other professional sporting associations who have criticized Black football players kneeling during the anthem and Black or Latino baseball players’ celebrating home runs. Moreover, the criticism of Williams’ form-fitting clothing and the reactionary new dress code it spawned are merely the latest in a series of critiques of Williams’ physique. In reanimating the dress code, FTF officials are engaging in boundary work to preserve the status of a certain kind of tennis — and, by extension, a certain kind of tennis player — at the top of the hierarchy. In so doing, it is limiting the expression of a sports icon who redefines beauty and femininity and perhaps elite tennis itself. Amy August is a doctoral candidate in Sociology at the University of Minnesota. Her research focuses on education, family, culture, and sport. Her dissertation work uses qualitative methods to compare the forms of social capital recognized and rewarded by teachers and coaches in school and sports. Amy holds a BA in English Literature from the University of Illinois at Chicago, a MA in Teaching from Dominican University, and a MA in Comparative Human Development from the University of Chicago. Whether we wear stilettos or flats, jeans or dress clothes, our clothing can allow or deny us access to certain social spaces, like a nightclub. Yet, institutional dress codes that dictate who can and cannot wear certain items of clothing target some marginalized communities more than others. For example, recent reports of bouncers denying Black patrons from nightclubs prompted Reuben A Buford May and Pat Rubio Goldsmith to test whether urban nightclubs in Texas deny entrance for Black and Latino men through discriminatory dress code policies. For the study, recently published in Sociology of Race and Ethnicity, The authors recruited six men between the ages of 21 and 23. They selected three pairs of men by race — White, Black, and Latino — to attend 53 urban nightclubs in Dallas, Houston, and Austin. Each pair shared similar racial, socioeconomic, and physical characteristics. One individual from each pair dressed as a “conformist,” wearing Ralph Lauren polos, casual shoes, and nice jeans that adhered to the club’s dress code. 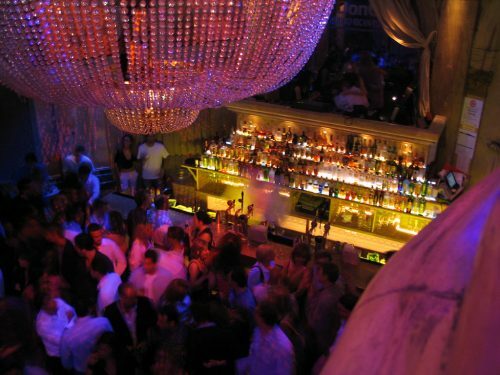 The other individual dressed in stereotypically urban dress, wearing “sneakers, blue jean pants, colored T-shirt, hoodie, and a long necklace with a medallion.” The authors categorized an interaction as discrimination if a bouncer denied a patron entrance based on his dress or if the bouncer enforced particular dress code rules, such as telling a patron to tuck in their necklace. Each pair attended the same nightclub at peak hours three to ten minutes apart. The researchers exchanged text messages with each pair to document any denials or accommodations. Amber Joy is a PhD student in sociology at the University of Minnesota. Her current research interests include punishment, sexual violence and the intersections of race, gender, age, and sexuality. Her work examines how state institutions construct youth victimization. Cosmopolitan is a highly influential fashion magazine, the 15th highest circulating magazine in the United States. Its covers matter, seen by 18 million readers a month and many more at checkout and newspaper stands across the country. Who are their covers representing, and have they become more racially diverse? I did a content analysis of Cosmo covers, randomly selecting a sample of 214 between 1975 and 2014. 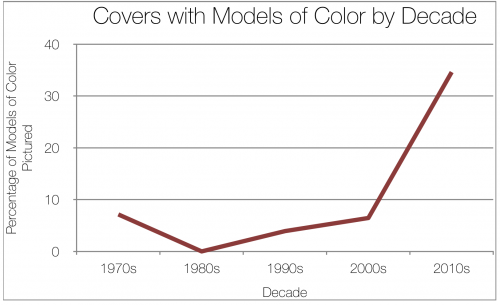 Since the 1970s and 2010s have fewer years represented, about half the number of covers were examined during these decades as compared to the 1980s, 1990s, and 2000s. Following sociologist Mary Nell Trautner and Erin Hatton’s study of Rolling Stone covers, I coded each image for race. Since the cover models are well-known, I could double check race codes with accessible biographical information about them. Overall, only 8% of the covers featured a person of color, including eight Hispanic women, four African-American women, four Middle Eastern women, and one Asian woman. The figure below shows that representation did increase over time. Among the 1970s, 1980s, and 1990s covers together, just 3% represented minorities, while the 2000s and 2010s covers together pictured minorities 16% of the time. What accounted for the increase? I posit that it had less to do with an interest in diversifying Cosmo’s cover models, and more to do with a shift in focus. In the late 1990s, Cosmo began using celebrities and pop culture icons on their covers instead of models, a trend which continues today. It was in this same time span that minority representation had the largest increase. This fits Mavrody’s (2014) study that there are lower numbers of models of color in the industry, at about 19%, and there is no action being taken to change this representation. What may be changing, however, is the representation of minorities in the entertainment industry. Movie and television stars shown on magazine covers in the most recent few decades include many more people of color than were seen when strictly models were on the covers. Despite little change in the modeling industry, the entertainment industry has begun to work toward more equality in representation. In television, while there are roles that have been written just for people of color, there has also been a trend of mandating the inclusion of minorities. It seems as though this industry knows their audience and what they desire, and they are actively trying to diversify all shows, not just those that solely represent minorities and the minority experience. This work toward inclusion would bring about more fame for minority actors and actresses, which would explain their higher representation in the media, as well. Alyssa Scull graduated from The College of New Jersey with a BA in Sociology. She is currently a MSW student at Columbia University, focusing on family, youth, and children in the practice and programming track. Sociologists are lucky to have amongst them a colleague who is doing excellent work on the modeling industry and, in doing so, offering us all a rare sophisticated glimpse into its economic and cultural logics. We’ve featured Ashley Mears‘ work twice in posts discussing the commodification of models’ bodies and the different logics of high end and commercial fashion. In a post at Jezebel, Mears exposes the Model Search. Purportedly an opportunity for model hopefuls to be discovered, Mears argues that it functions primarily as a networking opportunity for agents, who booze and schmooze it up with each other, while being alternatively bored and disgusted by the girls and women who pay to be there. …thousands arrived to impress representatives from over 100 international modeling and talent agencies. In the modeling showcase alone, over 500 people ages 13-25 strutted down an elevated runway constructed in the hotel’s ballroom, alongside which rows of agents sat and watched. 2013 International Model and Talent Search; photo by AJ Batac. But the agents are not particularly interested in scouting. In shadowing them during the event, Mears finds that they “actually find it all rather boring and tasteless.” Pathetic, too. The saddest thing at a model search contest is not the sight of girls performing womanhood defined as display object. Nor is it their exceedingly slim chances to ever be the real deal. What’s really sad is the state of the agents: they sit with arms folded, yawning regularly, checking their BlackBerrys. After a solid two hours, Allie has seen over 300 contestants. She’s recorded just eight numbers for callbacks. To be honest it’s just a networking event. The girls, most of them don’t even have the right measurements. For most of them, today is going to be a wake-up call. Indeed, networking is the real point of the event. The girls and women who come with dreams of being a model are largely, and unwittingly, emptying their pockets to subsidize the schmooze. I encourage you to read Mears’ much longer exposé at Jezebel. Does the modeling industry fetishize whiteness? It turns out that the answer is: it does and it doesn’t. Ashley Mears, a model turned sociologist, found that high fashion models are overwhelmingly white, but that commercial modeling — the kind you see in catalogs for stores like Target, TJ Maxx, and JC Penney — is much more racially inclusive. Similarly, extreme thinness is more pronounced among high fashion models, whereas commercial models tend to have a few more inches around their waists. Mears says that the difference has to do with the contrasting purposes of the different modeling worlds. High fashion is supposed to be, by definition, unattainable. The women used in high fashion, then, should be the most idealized, with bodies that are among the most difficult to attain and beauty that is the most rareified. In this context, whiteness is a marker of elite status because white femininity, thanks to white supremacy in U.S. culture, is the most purely feminine femininity of all. 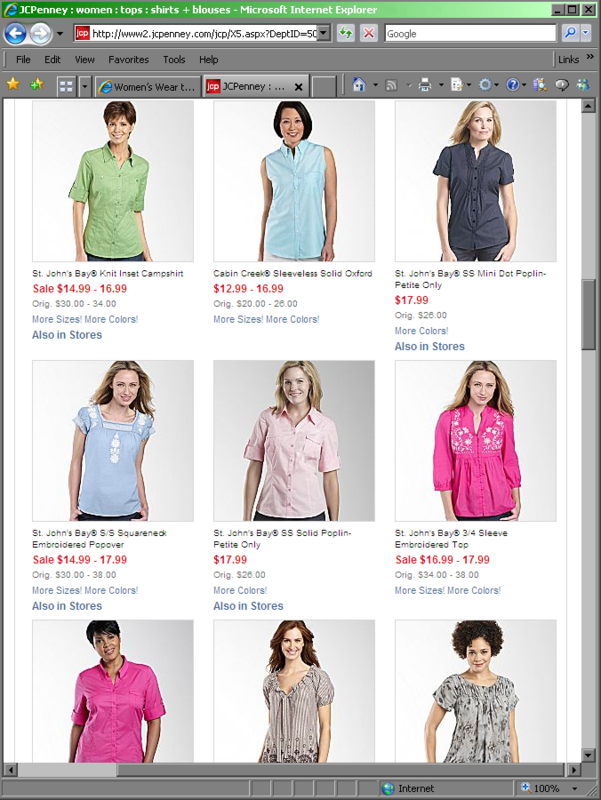 In contrast, the commercial market is actually designed to sell clothes to everyday people. In this case, they want consumers to identify with their models. Their models aren’t supposed to signify social distance, they’re supposed to be just like us. Using more diverse models and models who are less waif-like helps accomplish those goals.